It has been a dry Spring this year in Arkansas - there really hasn't been that much rain. Compare that to May of last year, when it rained every day for three weeks. There have been a few storms pass through this year, dumping some heavy rain, but it seems like the waterfall hunting season is coming to a quiet end. 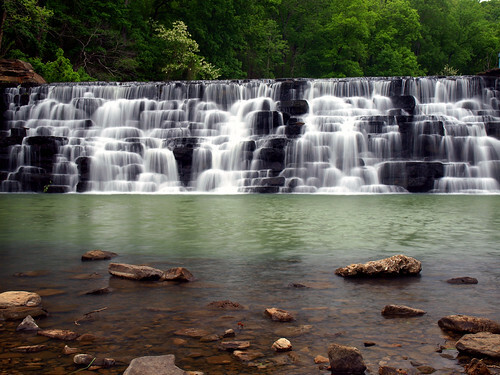 As I was driving through Clarksville I decided to try and visit a few waterfalls. It had rained a few days before, and I hoped that some of that water might still be making its way over some waterfalls. 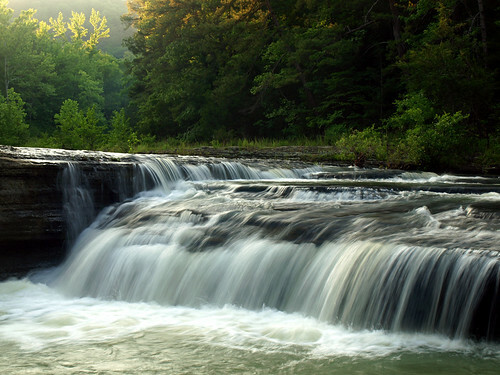 I made the relatively short drive towards Haw Creek, located in the Ozark National Forest. 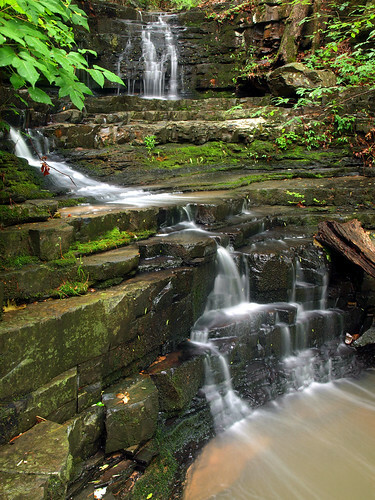 This is a neat area, with three great waterfalls all located within a short distance of each other. I had been wanting to take the new camera on a trip to Pam's Grotto for a few months now, so I headed there first. I went and inspected the creek that flows through Pam's Grotto to see if there was even any water there. A decent amount was flowing, so I decided to make the hike. Although it had been sunny all day, I thought I might get into the grotto when the sun had dropped down enough to put the grotto in shade. I wasn't sure how much daylight I had, so I tried to hurry up the trail as quickly as my out-of-shape legs would take me. Anyone who has ever hiked the trail to Pam's Grotto knows how foolish that is. The trail starts out by straight up several switchbacks on a steep hill. My attempts to rush up the hill were soon met by an unpleasant burning in my legs. "Why are you doing this?" they seemed to ask. I slowed down my hike, and finally made it to the top of the hill. My journey wasn't helped by the fact that it was only 88 degrees outside. I was doused with sweat when I finally made it to the falls. And when I did make it to the falls, I found that there really wasn't much water flowing through. I was a few days too late to capture it with much water. 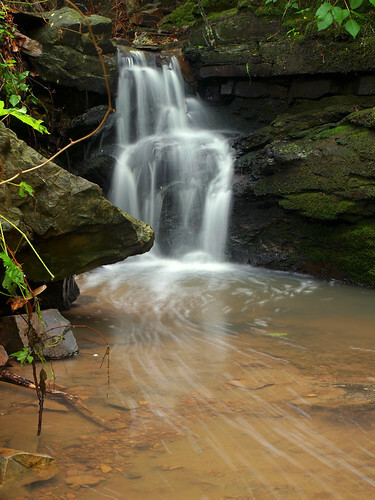 But Pam's Grotto is a neat waterfall, which spills over a bluff that is guarded by a massive boulder. I spent some time there taking pictures, but I'm not too happy with the shots since I know it would have looked better with more water flowing over the falls. 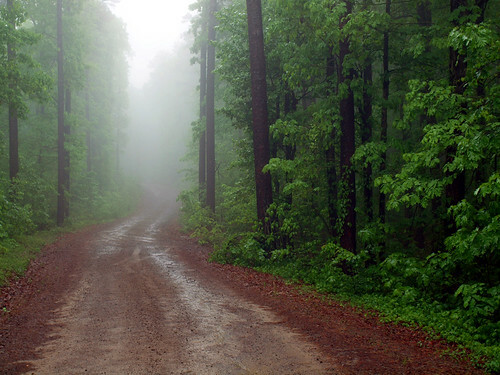 I hiked back to the parking area by Haw Creek, where my car was patiently waiting for me. The parking area is right by the creek, which did seem to have a nice amount of water flowing through. You can get some nice views of Haw Creek here, especially of this one boulder that sits right in the middle of the creek. 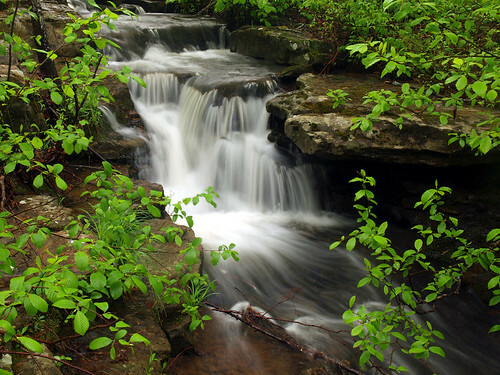 The water flows over a small waterfall, and then rushes past the boulder that sits alone in the middle of the creek. 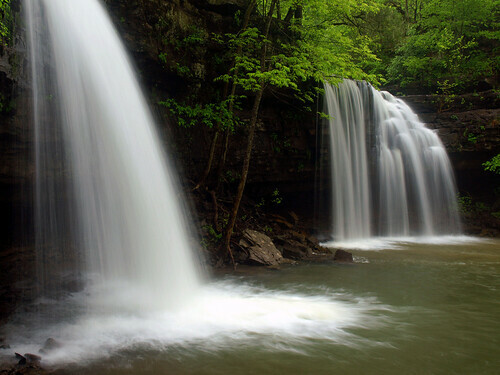 I got back in the car and made the short drive over to Haw Creek Falls. After having fun crossing the low-water bridge over the creek, I stopped at the campground and got out to explore the waterfall. 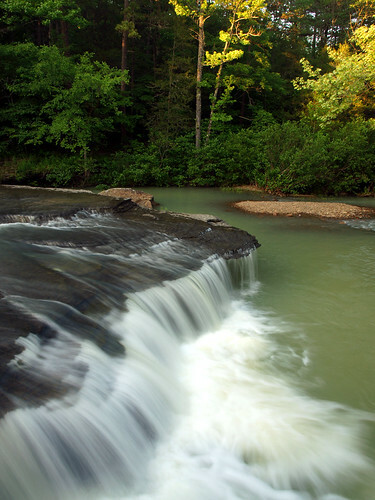 I wasn't sure if I should even stop for pictures at Haw Creek Falls or not. The setting sun was shining right onto the falls. But I went over there anyways, and saw that the setting sun was cutting through some smoke from a nearby campfire. It looked kinda neat, so I tried to get some pictures before the smoke drifted away and light faded. The smoke actually cleared out after a few seconds. But this is a shot of the falls, with some lingering smoke in the distance. 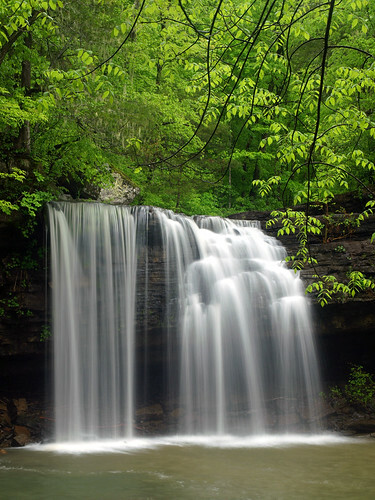 Even if it isn't the tallest waterfall, I like Haw Creek Falls. It's a neat spot, where the creek tumbles over a rock shelf. I headed onto the rock shelf and got some pictures looking down on the falls. The distant trees were catching the light from the setting sun, which turned them into a nice shade of gold. Last weekend I travelled to Charleston to watch my youngest cousin graduate from high school. Since I was in the western part of the state, I tried to find a few places to visit that might result in some decent pictures. But after some heavy storms, the weekend was bright and sunny. I wanted to visit some waterfalls, but the sunlight kinda messed that all up. On Sunday I headed home, and decided to take the scenic way back. I drove along Hwy. 64 from Ozark, heading towards Clarksville. Along the way is the small town of Altus, which is one of my favorite small towns in Arkansas. Considering its size, Altus has to be one of the most cosmopolitan small towns in Arkansas. 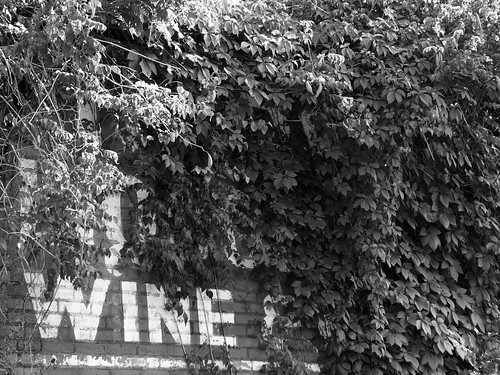 It has four wineries, and some really good restaurants. It's also one of only two places in the state where you can buy beer on Sundays (which may or may not have been my main reason for visiting there). 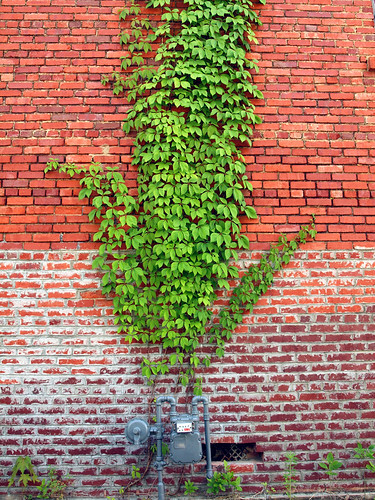 This shot was taken just off of the square in Altus, where vines are quickly overtaking an empty building that might have once been a liquor store. Another spot along Hwy. 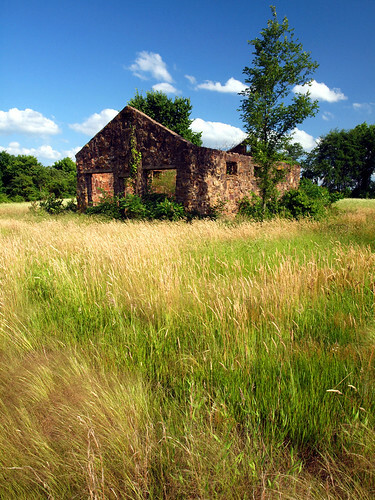 64 near Altus is this old stone building. The roof is gone, and only the walls remain. The ruins of what must have been a house still stand guard along the road, surrounded now by tall grass and weeds. I've stopped at this spot many times before, and taken quite a few pictures of this old building. "66 is the path of a people in flight, refugees from dust and shrinking land, from the thunder of tractors and shrinking ownership, from the desert's slow northward invasion, from the twisting winds that howl up out of Texas, from the floods that bring no richness to the land and steal what little richness is there. From all of these the people are in flight, and they come into 66 from the tributary side roads, from the wagon tracks and the rutted country roads. 66 is the mother road, the road of flight. Clarksville and Ozark and Van Buren and Fort Smith on 64, and there's an end of Arkansas." From there Steinbeck describes the roads converging on Route 66 in Oklahoma, and then follows the route with a painstaking accuracy. It's interesting to read that now, having travelled that route. 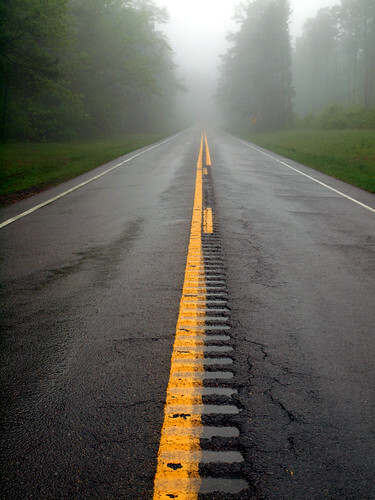 When I first read The Grapes of Wrath a few years ago, after having made my first trip west along Route 66, I was startled to see this small stretch of road that I've travelled along many times in Arkansas mentioned. 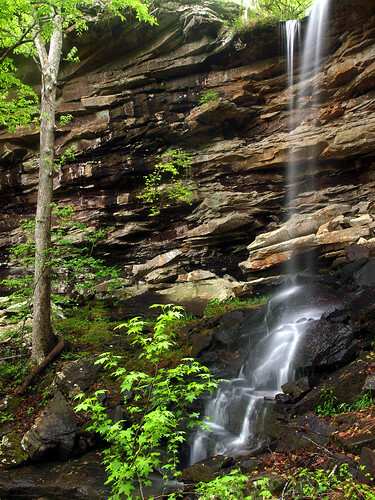 Due to its geography and location, there aren't many waterfalls around Little Rock. 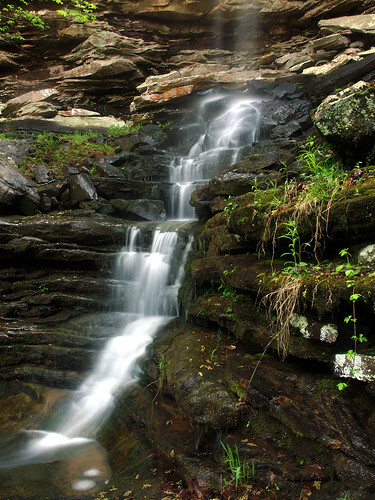 The city sits in the foothills of the Ouachita Mountains, which aren't known for waterfalls (like the Ozarks). 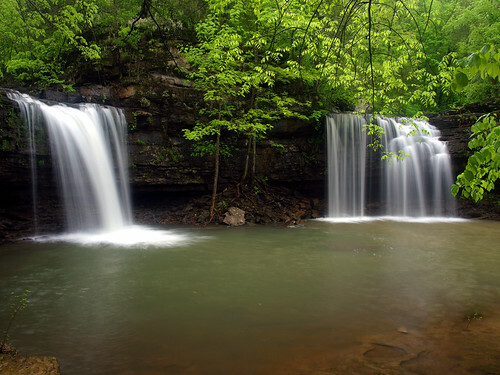 I know of only one natural waterfall in central Arkansas, and it's not all that well-known. 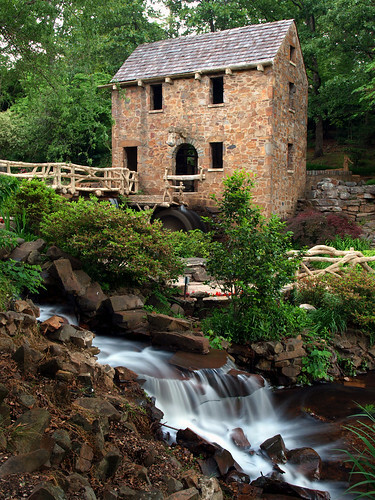 It sits in Emerald Park, and drops down from the "Big Rock." And a closer look at the top portion of the falls, which are about 10 feet tall. I travelled up to northwest Arkansas to attend my cousin's wedding a few weeks ago. This was the same weekend that some nasty storms passed through, including one with a tornado that went just south of downtown Little Rock. The weather forecasters predicted it would be stormy all weekend, which made things a bit dicey for the wedding - it was being held outdoors. But on Saturday night the storms held off, and the wedding went off without a hitch. On the way home on Sunday I made a quick visit to Devil's Den State Park, located south of Fayetteville. 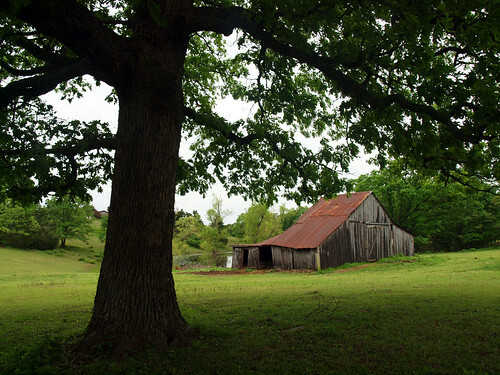 The park is located just a short drive from the freeway, and you pass by some neat old barns along the way. This old barn sits just off of the side of the road. 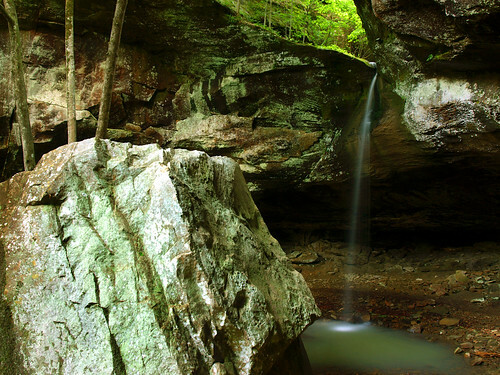 Devil's Den features many neat scenic places to visit. There is a stone dam at the park, built by the Civilian Conservation Corps during the Great Depression. 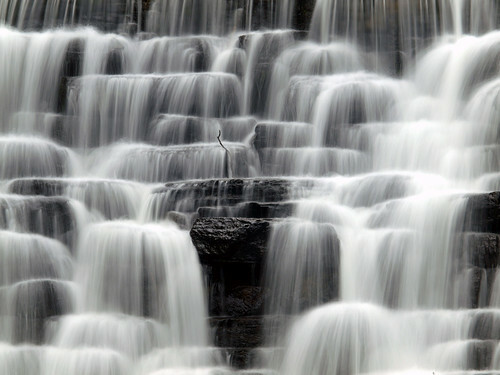 The waters of Lee Creek flow over the dam, in a series of cascades and falls. I headed over there to take some pictures. Construction of Devil's Den State Park started back in 1933, and is now considered to be one of the finest examples of preserved architectural projects by the CCC. 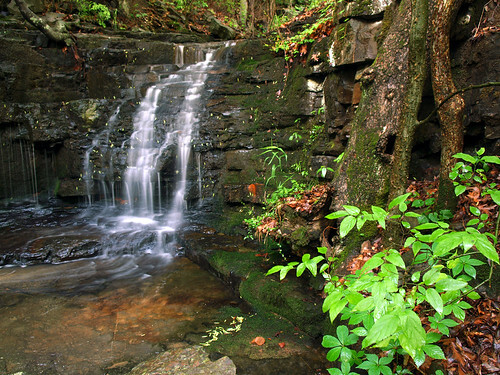 The dam, with the spectacular waterfall, is just one of the many CCC works in the park. While trying to find out more about cave closings at the park, I stumbled upon this historical tidbit about Devil's Den. Part of the old Butterfield Overland Mail route passed through the park. What's the Butterfield Overland Mail route? Well it was established back in 1858 by the postal service to send mail between both St. Louis and Memphis to California. While not many people have probably heard of it now, it was a big deal back in the 1800s. 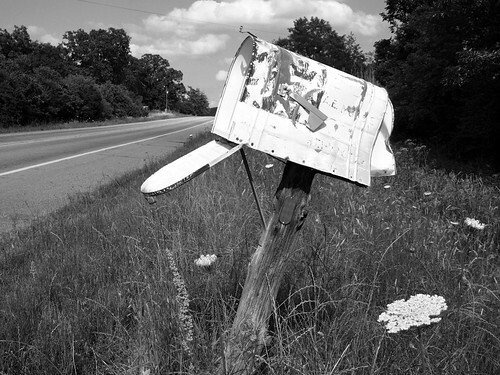 The route stretched for 2,800 miles across the country, and it cost someone just 20 cents to mail a letter. If you wanted to travel the stagecoach route, it would cost you somewhere between $150-$200. It took 28 days to make the journey, with an average speed of about 5 mph. At the time, it was the longest stagecoach line in the world. 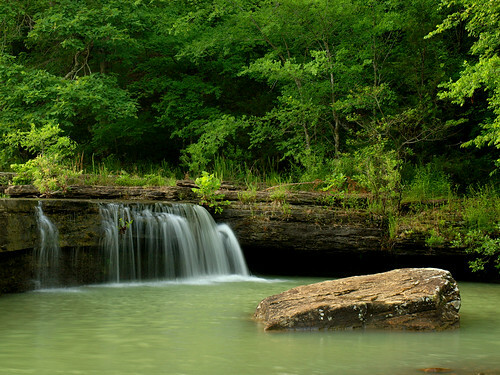 The route from St. Louis dropped down through the Ozarks, passing through Fayetteville and past what is now Devil's Den State Park. The caves and crevices at the park provided an ideal hideout for outlaws along the stagecoach line. When the Civil War started in 1861, the rocky areas of the park were used as a hide-out and staging area by Confederate guerrillas. During the war, the Butterfield route was used by both sides to transport troops during the battle of Prairie Grove and on the raid of Van Buren. Forgive me for going off topic here, since I've spent a good amount of time now reading about the old Butterfield Stagecoach. I had heard about it before, since one of the old stops along the route was in the small town of Charleston, which is where a lot of my family is from. The stop in Charleston was part of the Butterfield route which headed west from Memphis, through Little Rock and then south along the Arkansas River to Fort Smith. My grandparents used to have a house in Charleston which had a large front yard, where the old stagecoach route passed through. 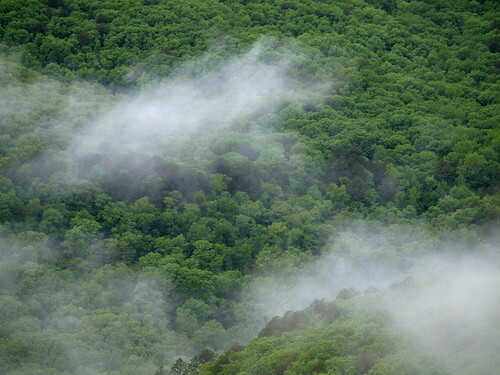 You could see the traces of the route there, thanks to a faint break in the trees. It's a bit of history that I regret not appreciating at the time, especially when I had the task of mowing the yard. But that just goes to show how there is an amazing amount of history around here, but which seems to be mostly forgotten. Most of the old statecoach route, except where it passes through someone's front yard, has been largely forsaken. 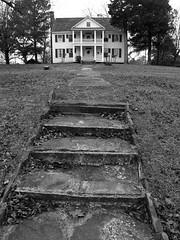 One of the few remaining historical spots along the Butterfield Route is Pott's Inn, in Pottsville, Arkansas. But there is some other old history in Devil's Den State Park - the old town of Anna, which sat along Lee Creek. The town was destroyed during a flood in 1893, and only a cemetery, a well, and some stone foundations are all that remain. That evening, I tagged along with a few other photographers from CSNP to visit some other nearby waterfalls. John Moore took Jon Wisniewski and I first to the nearby Hudson Shelter Falls. Even with the rains that morning and the day before, the falls were barely a trickle. The shelter below the falls, which stretches far back under the bluff, was neat to explore. From there we visited another waterfall, which had actually just been discovered not too long ago. Even though a logging road runs just above the falls, it doesn't seem like many people have ever ventured into this hollow and to the falls. 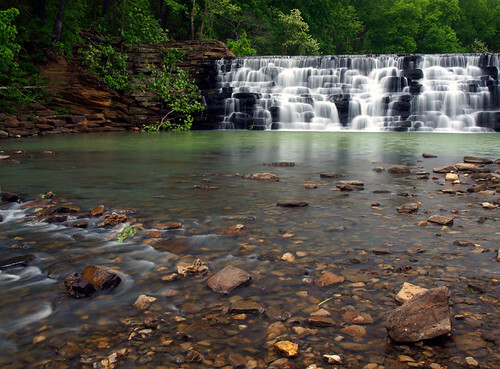 It was amazing to me that places like this exist in Arkansas, where you can claim to be one of only a handful of people that have seen that waterfall. 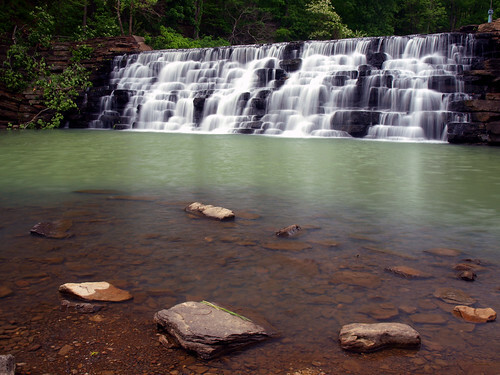 The falls are located not far from Hwy. 7, near the town of Cowell. I'm not sure of the directions, but you turn by a cemetery and then head down a dirt road (which I realize describes most of the rural roads in Arkansas). We parked and walked down a logging road, and then bushwhacked the short distance to the falls. 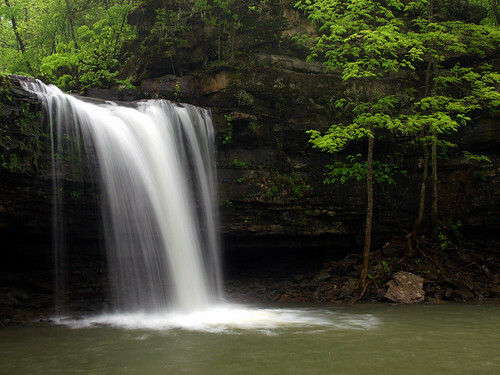 Lonesome Hollow Falls have been measured at 47 feet tall. 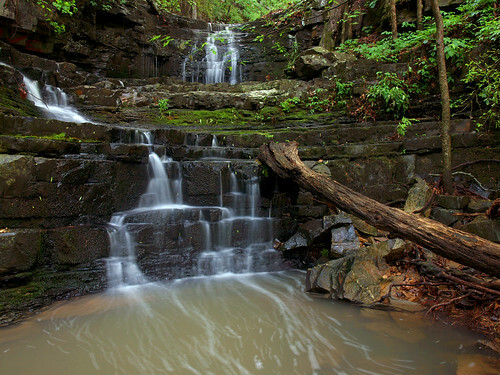 And another shot of the Lonesome Hollow Falls. 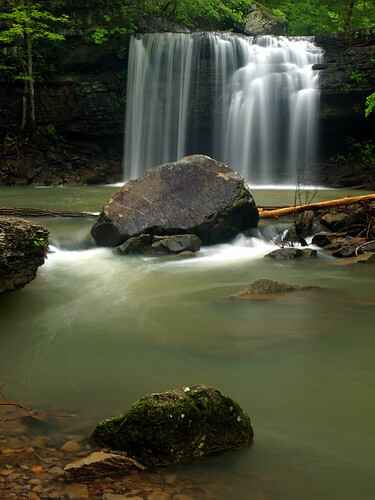 The falls won't be lonesome for long, they are slated to be included in the next edition of Tim Ernst's waterfall guidebook. 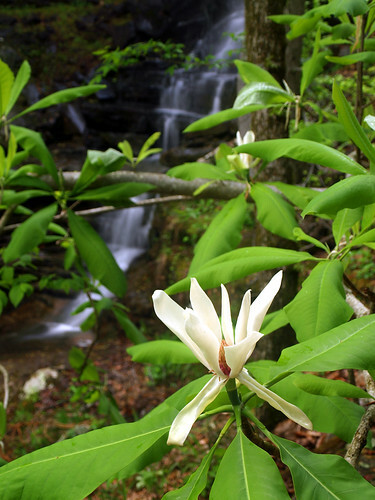 There is more to see in the hollow besides the waterfall. There is small shelter under the bluff, which was filled with all sorts of Native American artifacts. There was a table set up that looked to be an old work bench, with chunks of rocks that were being turned into arrowheads. There are also rock piles set up like chairs and benches. It was an amazing thing to see, and something that I never expected to encounter in this modern age. We did joke that it was probably best to not mess with any of the rocks or artifacts, lest we set off some sort of Indiana Jones style booby trap. 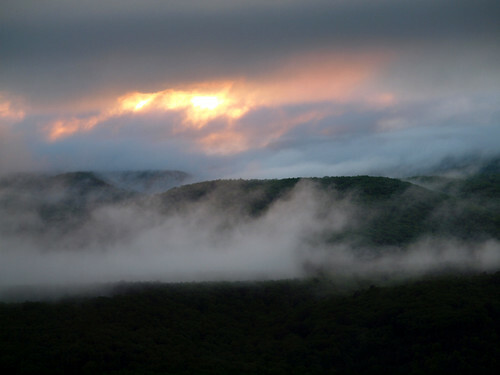 That night saw some pretty heavy storms pass over our campsite, which was encased under a heavy bank of fog. The plan was to wake up before sunrise and then make the drive over to Richland Creek, where hopefully there would be some fog hovering above the creek. We ended up driving there and found no fog, and the sun breaking through the clouds. Richland Creek was running high and a bit muddy - the recent rains having done much to raise it overnight. After debating some hiking options, a few of us decided to make the hike over to Twin Falls. It was somewhat risky, since there was a chance that we would hike there only to have the sun be out - which is not good for waterfall pictures. But we soldiered on, and made the drive over to the trailhead next to the old Hill Cemetery. It was good that we had Zack's jeep, since we were able to make the rough and bumpy drive to the trailhead. The road there is not in good shape, and you really need a jeep or anything with 4 wheel drive to make it there. It'd be pretty foolish to drive a regular car down there (like I did a few years ago). 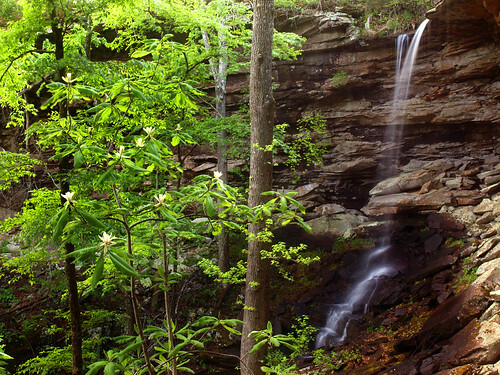 Twin Falls are located in the Richland Creek Wilderness Area in the Ozark National Forest. The hike to get to the falls and back is about six miles total. You have two options for exploring the beautiful landscape out there - take the high road which follows an old road trace that will take you near the falls. It's relatively easy, with just a few hills to travel over (that is, until you need to leave the road and head to the falls). Or you can take the low road, which is much more difficult. 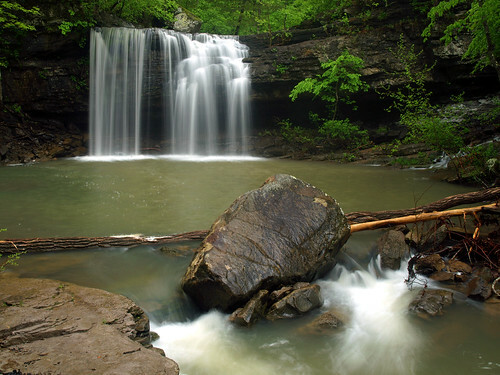 This involves a bushwhack over rocky and treacherous terrain along one of the creeks that makes Twin Falls. This is the path that I took on my previous visit to the falls. It's not easy at all. We took the easier version. To take the way by the creek you should bushwhack down the hill to Big Devil's Fork after crossing this small creek, which has several little waterfalls. After hiking about three miles, you need to veer off of the old road trace and make your way downhill. This is much easier said than done, since there are no trails through here and the hill is steep. We dropped down, just as it started to rain on us. Eventually, we made it to the falls, which were flowing quite nicely. This was actually taken while taking shelter under the bluff to avoid some heavy rain. 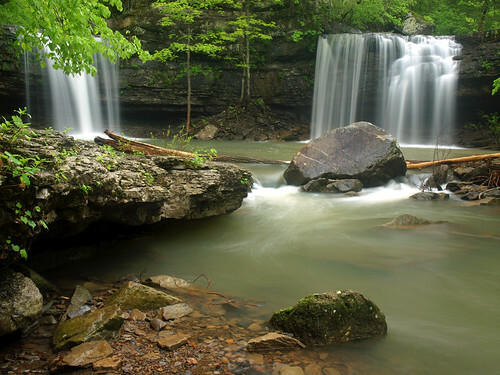 Twin Falls is made up of two creeks - Long Devil's Fork and Big Devil's Fork. They both flow right next to each other and then shoot out over a 20-foot tall bluff. 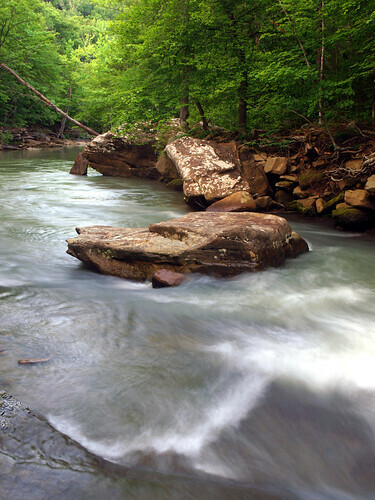 They meet up below the bluff and then flow into Richland Creek. 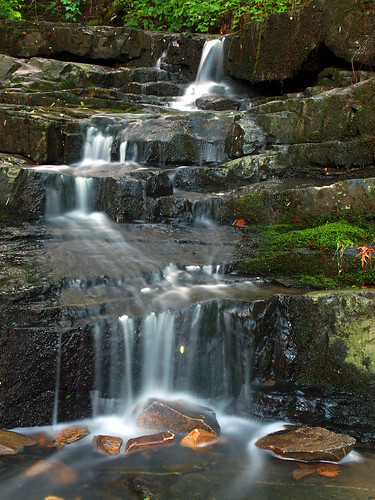 It is perhaps one of the prettiest waterfalls in the state, and one of the most difficult to reach. It began to get a dark, which seemed a bit eerie and ominous. It meant that a huge storm was going to hit soon, which meant that it would be best to find a dry spot as quickly as possible. I was trying to get pictures of the creek below the falls when it started to rain, and I got caught out in the deluge. I'm grateful that my camera bag is water-proof. We all took shelter again under the bluff next to the falls. We waited about twenty minutes for the rain to clear, and I was planning on getting a few more shots of the falls when the rain let up. But of course, as soon as it stopped raining, the sun came out. 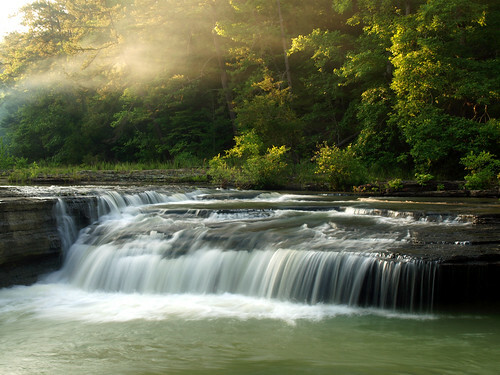 Sunlight is the nemesis of waterfall photography, so it kinda ruined things. Looking up, there were clear blue skies as the clouds drifted away. It looked like we were now done shooting out there. I made another stop at the Rotary Ann overlook along Hwy. 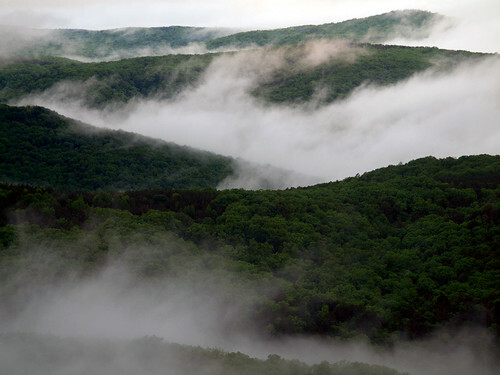 7, where the fog was breaking up along the distant ridges and hilltops. I ended up taking a ton of pictures out at this spot, watching the clouds drift along through the valley. After using up way too much of the memory card, I decided to head back to the car. As I was putting the tripod in the back of the car, I turned around just in time to see the sun break through the clouds and fog. The valley was illuminated in a beautiful light, seeming to spread out across the entire view. I ran and tried to set everything back up, but of course, got there too late. Oh well. After that I made the short drive north to join the rest of the gang at Fairview.